The timing was too perfect – stepped out of Clink78 and saw these two cheery chappies! Last weekend I spent a night in a prison cell. Fortunately, I walked free the following day without any (criminal) record of my stay. How? I booked a night at Clink78 hostel in London. If you’re not familiar with Clink78, it is a hostel near Kings Cross train station in London that has a fascinating history dating back to 1792. 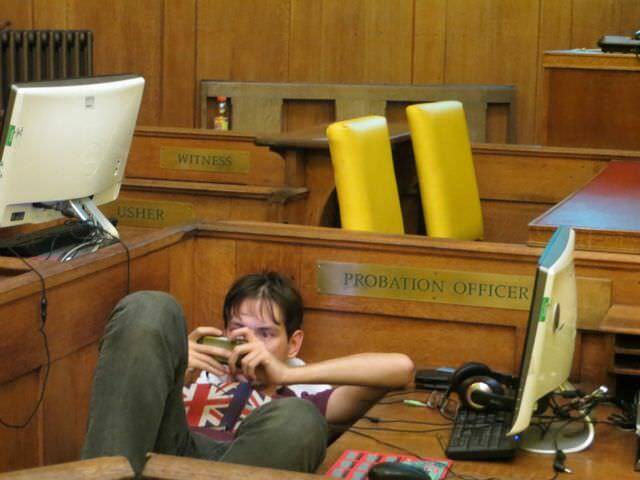 Serving first as office space where Charles Dickens is reputed to have scribed Oliver Twist, the building went on to become Clerkenwell Magistrates Court. In 2008 the court closed its doors on miscreants and welcomed a different kind of clientele when it was transformed into a backpacker’s hostel. The cunning owners preserved much of the building’s interior, providing a fun themed place to rest your head in Central London. Check out Clink78’s timeline and note the reference to The Clash once standing trial in the court. 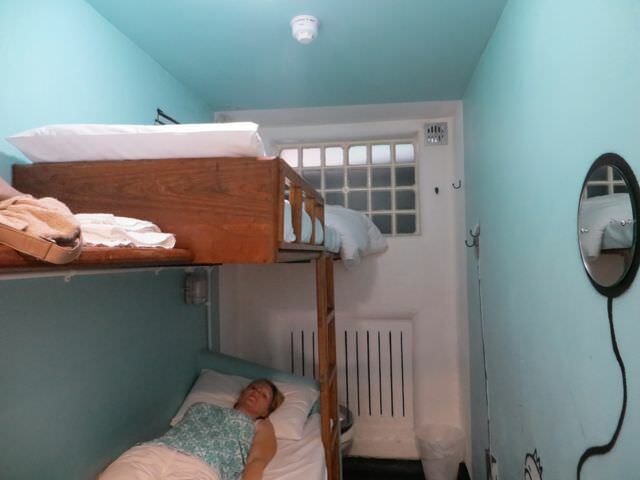 One of the most appealing parts of the hostel was the cell rooms, which seemed like the ideal choice for two lawyers (ok, I’m a ‘retired’ lawyer) with a propensity for missing the last train out to the suburbs. Snubbing the prospect of another night in a bland Travel Lodge or sleeping amongst the masses in a dorm, we upgraded to the luxury option of a 6×4 prison cell. 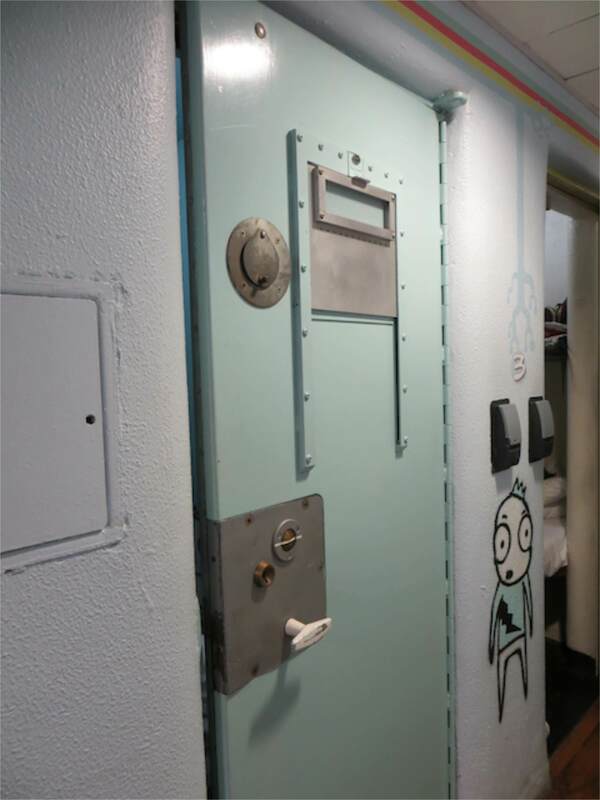 Despite being fully aware that we had a cell room and having talked my friend into the concept despite her harbouring an irrational fear of being imprisoned for a crime she didn’t commit (too much of the A-Team as I child I suspect), hearing “You’re staying in Cell 3,” felt like a slap in the face when we checked it and a funny feeling came over me (mainly through fear there would be an inappropriate pat down). Relieved that we were free to make our own way to the cell, our civilian clothes allowed, my eyes nearly felt out of my head and I started to feel a giddy mix of nervousness and excitement when I saw the row of cell doors (remember, we had just had a Champagne fuelled Afternoon Tea at the Langham Hotel). Inside, the concrete base of the bunks filled the left wall, making me realise how similar hostel dorm and cell structures are, while at the end of the bunk sat the old toilet. Thankfully it had been cleaned and covered over to prevent use but the cell was as close to real as I ever wanted to get. After a night on the town, careful in our behaviour to ensure we returned to our allotted cell and not one that would not permit optional exit the next day, we made it back to the hostel. With one last drink for courage, we settled into our cell. 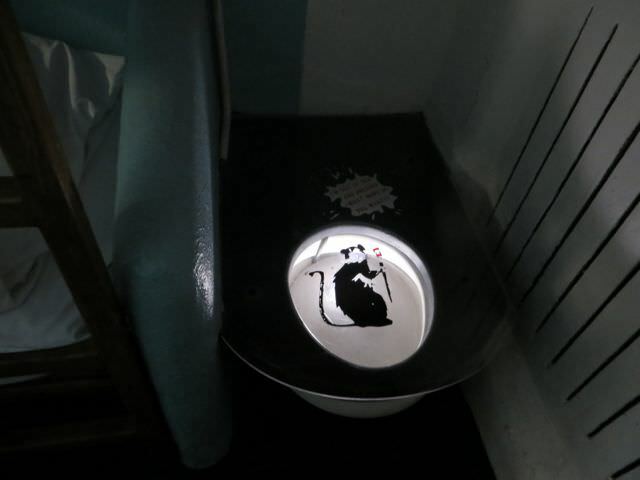 It took longer than usual for me to fall asleep that night, mainly because of the novelty of the situation, but eventually, head resting away from the toilet end, I drifted off into an innocent sleep. The next morning it was my alarm not natural light that woke me and I blinked through the darkness keen to open a window to let in some air. Of course, the only internal reference to the outside world was a tiny pane of mottled glass that seemed to face a wall, clearly couldn’t be opened and didn’t even let in any real light. As claustrophobia started to circle, the air grew heavier (with gin cocktail remnants) and the novelty of a cell stay started to evaporate, we packed (one at a time – there was very little space in the cell) and secured our release. As we had only one night booked in London and with plans the next day, we didn’t spend a huge amount of time in the rest of the hostel but overall it was clean, social, the staff were beyond helpful and the location was in a great, safe area – walking distance to Kings Cross and St Pancreas in under 10 minutes. Free breakfast (toast and nutella on Sundays I was told) was available, but we ate breakfast elsewhere so I can’t comment. The hostel had a bar in the basement (Clashbar) that had a fair number of people in it when we got there at midnight and was open until 3am. The jagermeister has deleted all memories of how much we paid for drinks. Sorry! 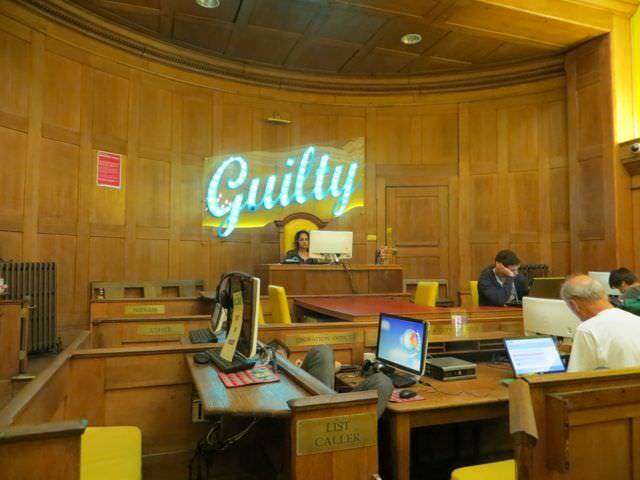 The old court had been turned into a funky internet room, but the presence of the Guilty sign seemed to have an affect on the occupants who Facebooked away in a silence that was ideal if you want to blog or work, but otherwise not so welcoming or social. 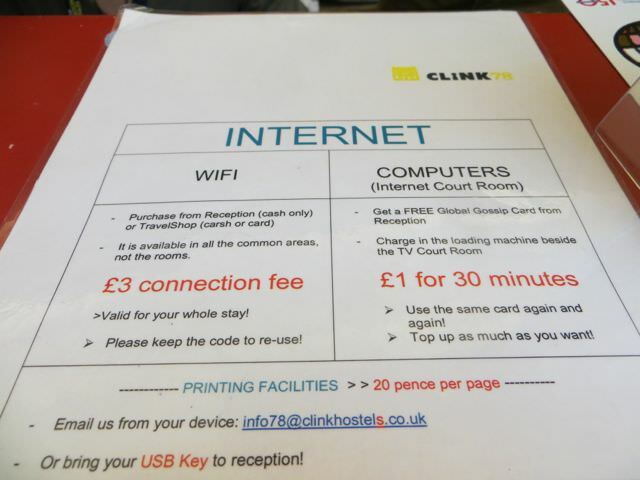 While I’m on the point of the internet, there is a £3 connection fee to get online. In 2013 in the UK where there are very affordable internet packages on the market, this struck me as hailing from the Ryanair School of Business – cheap and a little bit nasty. If I can get free wi-fi in Nicaragua, why can’t I get it in London? However, we did get free towels, so that is a bonus (although I’d personally prefer free wi-fi!). On the hostel’s website the cell rooms are quotes as from £50 per night. We paid £72 and booked the room months in advance so I’m not sure what you have to do to get the cheaper quoted price – possibly stay mid-week (we stayed on a Saturday night). Dorms are quoted as from £12 per night, which is a rare and excellent price for this location in London. However, I’d want to understand what confluence of circumstances would need to be in place to secure that price – doing a search for the next two weeks for a mid-week stay for one night, the cheapest rate I could find on the hostel’s website was £14 for a 16 bed dorm. Still, that’s a very decent rate, particularly with breakfast included. It was an interesting stay, but not one I could endure for more than a night – it felt too claustrophobic without natural air and let’s not forget cost for the experience. For a dorm stay, this place seems like a very sweet deal and I’d highly recommend it – but Starbucks might be a better choice for wi-fi! For more information see the Clink78 website. Clink has a second hostel Clink261 that also looks funky. However, it only shares the Clink name – the building is not a former court or prison. Plus, read the front page references to east London and Hoxton carefully. At first glance I thought Clink 261 was out east, but that’s not the case. 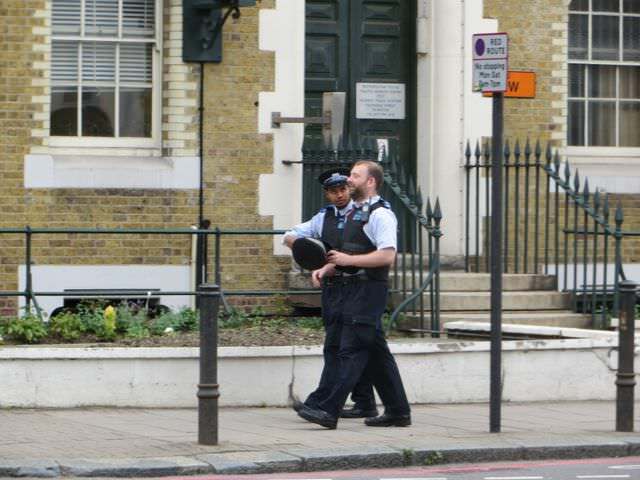 It’s located similarly close to King’s Cross on Gray’s Inn Road! It just aims to exude the trendy east-end style. Have you stayed somewhere quirky? If you have any recommendations for a future stay in a funky hotel or hostel, let me know in the comments below. Want to read more about finding accommodation? Click below. What an interesting place to stay! I worry about my slight claustrophobia but I would love to stay there. Agree about paying for wifi though…one of my pet hates!! Thank you, great read!